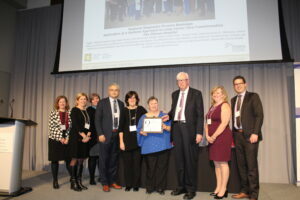 The Ottawa Hospital Cancer Transformation Team and the extended clinical care teams have been awarded the Cancer Quality Council of Ontario’s Top Quality Award for their work in reducing wait times and streamlining access to high quality care for one of the most lethal cancers facing our population – lung cancer. Their work involved the implementation of the Ottawa Health Transformation Framework – a redesign process that includes patient engagement, a collaboration platform for change, technology workflow solutions and traditional performance methodologies. The work was notable for the significant end user participation in the design process including clinicians, patients, and managers and for its sustainability. As a final result this transformation initiative has reduced the time to access high quality individualized care by up to 48% while at the same time introducing a number of design changes and innovations in care delivery across a spectrum of care providers. The Transformation Team work has been featured at a number of Telfer School learning events offered as part of the Telfer Health Transformation Exchange commitment to foster and promote innovative approaches to healthcare delivery. Please visit this link to see details of the award and learn more about the Cancer Quality Council of Ontario. Please visit this link to see a YouTube video of the award presentation. New Publication in PLOS One!